Correcaminos (4-1) recorded its first loss in Colon on Tuesday night. Hosts were defeated by fifth ranked Halcones (3-2) 73-69. It ended at the same time the four-game winning streak of Correcaminos. It may be a crucial game in the contest for the top position in the league. The best player for the winners was the former international forward Anell Alexis (200-90, college: Marist) who scored 16 points, 6 rebounds and 6 assists. 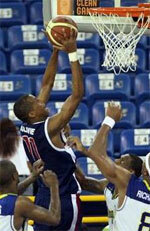 American power forward Christophe Massie (206-77, college: Memphis) chipped in 12 points and 15 rebounds. American forward Terrence Shannon (203-79, college: Elgin CC, agency: DTMones) produced 22 points and 6 rebounds for the hosts. Halcones moved-up to second place, which they share with Panteras. Defending champion Correcaminos still keep top position with one game lost. Another exciting game was played in Aguadulce between fourth ranked Panteras and 3rd placed Caballos where Panteras (3-2) beat Caballos (2-3) on the road 84-78. It ended at the same time the two-game winning streak of Caballos. It was a key game for the second position in the league. Puerto Rican guard Jorge Matos (185-92) orchestrated the victory by scoring 25 points and 9 rebounds. B Martinez contributed with 16 points, 11 rebounds and 4 assists for the winners. Puerto Rican point guard Alvin Cruz (186-82, college: Niagara) answered with 21 points, 9 rebounds and 5 assists for Caballos. Caballos' coach David Rosario rotated ten players in this game, but that didn't help. Panteras moved-up to second place, which they share with Universitarios. Caballos at the other side dropped to the fifth position with three games lost. Correcaminos (4-1) recorded its first loss in Colon on Tuesday night. Hosts were defeated by fifth ranked Halcones (3-2) 73-69. It ended at the same time the four-game winning streak of Correcaminos. It may be a crucial game in the contest for the top position in the league. The best player for the winners was the former international forward Anell Alexis (200-90, college: Marist) who scored 16 points, 6 rebounds and 6 assists. American power forward Christophe Massie (206-77, college: Memphis) chipped in a double-double by scoring 12 points and 15 rebounds. American forward Terrence Shannon (203-79, college: Elgin CC, agency: DTMones) produced 22 points and 6 rebounds and the former international swingman Isaac StRose (190-83, college: John Brown) added 18 points, 6 rebounds and 5 assists respectively for the hosts. Five Halcones and four Correcaminos players scored in double figures. Halcones moved-up to second place, which they share with Panteras. Defending champion Correcaminos still keep top position with one game lost. Another exciting game was played in Aguadulce between fourth ranked Panteras and 3rd placed Caballos where Panteras (3-2) beat Caballos (2-3) on the road 84-78. It ended at the same time the two-game winning streak of Caballos. It was a key game for the second position in the league. Panteras brought some defensive toughness making 7 blocks. 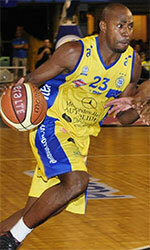 Puerto Rican guard Jorge Matos (185-92) orchestrated the victory by scoring 25 points and 9 rebounds. B Martinez contributed with a double-double by scoring 16 points, 11 rebounds and 4 assists for the winners. Puerto Rican point guard Alvin Cruz (186-82, college: Niagara) answered with 21 points, 9 rebounds and 5 assists and naturalized Puerto Rican Nate Butler-Lind (198-89, college: TCU) added 13 points, 8 rebounds and 5 assists in the effort for Caballos. Five Panteras and four Caballos players scored in double figures. Caballos' coach David Rosario rotated ten players in this game, but that didn't help. Panteras moved-up to second place, which they share with Universitarios. Caballos at the other side dropped to the fifth position with three games lost.